Sometimes a simple, unassuming facade doesn’t do justice to what lies within and it takes a little curiosity and just a tiny leap of faith to discover what may be a unique treasure. That premise probably applies to people as much as anything else as well. Meet this week’s Doer and Dreamer, Noé Del Cid, who is doing a heckuva lot more than claiming turf on Broadway in Midtown Kingston for a great little café. Peace Nation’s mission is to create goods and services in an environmentally responsible way. We want to provide value to consumers and appeal to their desires to make the world a better place. Peace Nation actually Started as a t-shirt and event production company with our first design being our classic and best seller “love kindness compassion” t shirts. Later we developed our current shirts made from hemp and organic cotton, which we are now in the process of moving manufacturing from China to NY and will proudly put made in the USA on our label with a relaunch for the fall 16′. Under the Peace Nation brand also produced some events starting with workshops based on sustainability, permaculture, meditation, followed by a line up of DJ’s and are looking forward to producing these events in the near future. 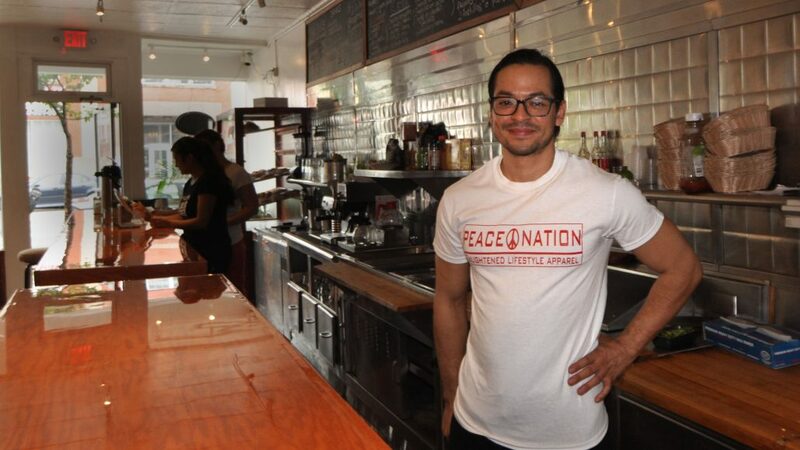 Peace Nation Cafe is our latest venture. 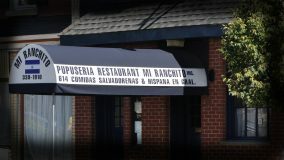 We focus on latin food as that is my background I have some experience in. We source local organic ingredients as much as we can and the meat that we do carry is grass fed, hormone free and antibiotic free and we carry a variety of vegetarian options. We do breakfast lunch and dinner Tuesday through Sunday. I’d say we are still in “beta” testing as i’m still developing the menu and price points, seeing what works, what doesn’t and adjusting, improving, and building a great team to execute the menu. I’m aiming for a grand opening in the beginning of September. We use proceeds from our sales to fund our non-profit The Global Sustainability Foundation. I am aware of the problems we as a planet have to overcome and like to help on solving these issues and understand we can do this by working together. The Global Sustainability Foundation is my life’s work. Its a non profit dedicated to building the city of the future today. I have a clear vision of what the future could look like and I feel we are not headed in that direction and thought, why doesn’t someone do something about this, and I realized I am someone. Peace Nation and the Global Sustainability Foundation where born and they gave my life a whole new meaning. I was born in Guatemala City, Guatemala and was brought to NY when I was six. Then moved back to Guastatoya El Progresso, where my father is from where i spend my early teens. In 2000 moved back to Westchester where I finished HS in Horace Greeley HS, where I was encourage to achieve something great with my life. Left home when I was 18 and have been floater moving every 2-3 while searching for my higher self, that search has lead me to kingston. opportunity for my company to operate, for the company and myself to put roots down and develop my ideas. Recently having a new born son, I think a place away from traffic, congestion, and stress is a good place to raise family. Kingston Point Park, very serene and peaceful and I love the energy of the Hudson river. I love New York City. Its world hub for ideas, finance and people, I believe I came to the United State for a reason and New York is place where you can make things happen. Lots of creative energy. When not in drive mode and need to getaway and reset I like to go to Guatemala and Costa Rica. Guatemala because its my homeland, go see family, the sites, connect with the food, culture, and art. In Costa Rica I go to Dominical a small surfer town, and practice surfing and yoga and forget about my corporate responsibilities for a few days. Try to go towards the end of February to catch Envision festival; a yoga, arts and music festival with deep roots in permaculture and sustainable practices and has been a major influence in the way I run my business here in New York. I do not like to take credit for my ideas. I feel they are part of the collective consciousness and we all have the ability to tap into the unseen.